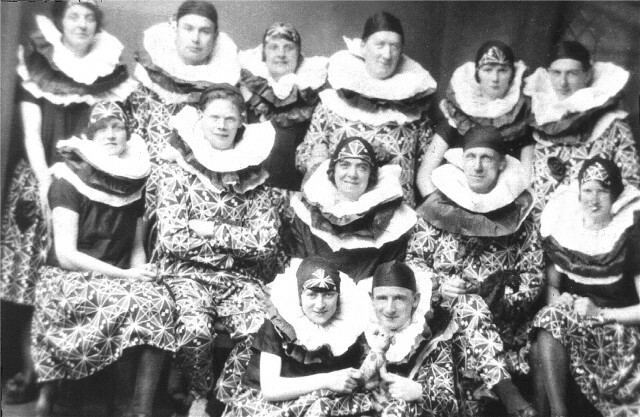 Between the Wars, Invergordon had its own concert party 'The Pierrots'. L to R back row: H.L. Macdonald, John Wallace, Matta Bremner, Willie Ogilvie, Margaret Ross, Frank Gow. Second Row: Mrs. Macdonald (Birky), Willie Ross (Dairy), Jean Macdonald, John Macpherson, Margaret Maclennan. Front Row: Mary Mackay, Hugh Taylor. Jean Macdonald was my parents' neighbour in Seaview, West end of High Street. I often visited her as a lad. Her Father had been Provost of Invergordon and a sister-in-law to the Minister Dr Duncan Fraser. Mrs Birky's husband was the tailor, and Matta had the bakehouse and Bremners shop (a general grocers). Jean Macdonald's sister Helen from the Manse ran the Guides. Mary MacKay was married to my father's (James MacKay) cousin Babe Mackay. I last saw them around 1968 when they visited us in Saint John, NB, Canada. My wish is to someday visit Inverg, my father's birthplace and to unite with all my cousins. David, that isn't the same Mary Mackay that you're thinking of. The Mary Mackay in the picture is my mother (died 2001), who married Bill Dryden when he was based locally with the RAF during the war. I used to hear a lot about the Pierrots, they must have caused quite a stir in Invergordon! There are a lot of Mackays in the area, so it can get tricky tracing family history. I quickly drew a blank trying to follow my mother's lineage in Inver (near Tain) where her family came from - at that time Inver was composed of 50% Mackays and 50% Skinners, differentiated by nicknames. My grandfather John Mackay was 'Jock an Tile' on account of his fondness for wearing a Tile (Top) hat! Fraser...Thanks for bringing that to my attention. The search continues for my father James b. 1912 and grandfather Allan b.1886 who married Georgina MacPherson around 1909.